30 minutes to Hatsushima from the Atami Port by ferry. Atami can be reached by shinkansen in approx. 40 minutes from Tokyo and approx. 90 minutes from Nagoya. We have many day trip packages available for your trip to our resort island. 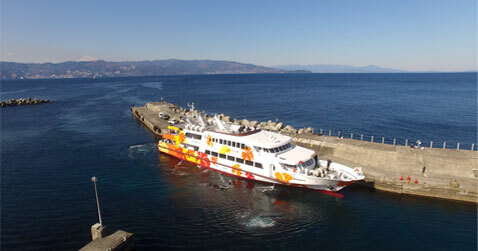 Hatsushima can be accessed by two types of ships: Ile de Vacance Premier and Ile de Vacance III. These high-speed ships head to and from Hatsushima nine times a day. Please see the schedules below and arrive at the dock accordingly. Ferry tickets may be purchased at the Atami Port Window. *Reservations are not required. However, please arrive early for your ferry. *Round trip ferry tickets are available for purchase. Children of middle school age and above must purchase adult tickets. Children of elementary school age and under may purchase child tickets. *We will charge a pet fee for dogs, cats, etc. *If lodging at Hatsushima Island Resort, please mention at the counter. *For the end/beginning of the year between December 26, 2015 and January 4, 2016, the service will be operated under the schedule of the "regular period." From January 5 to 28, it will be operated under the "dock period." *In bad weather and the busy period (such as Golden Week), the schedule and the number of service ships may be subject to change. Thank you for your understanding. *If the ship is filled to capacity, you may not be able to board the ship at your desired time. Thank you for your understanding. Regarding bus service from Atami. *May change depending on current traffic conditions. The island closest to Tokyo. copyright(c) 2019 FUJIKYU MARINE RESORT., All rights reserved.